Lock in a great price for Hotel Akti – rated 8.7 by recent guests! I have to say that Despina (hotel manager) and all her staff treated me like a celebrity. They made me feel special and at home. Given I was travelling alone this meant a lot to me. She let me store my bag there while I went to Thassos for two nights. Vassilis my beach server gave me great directions of places to go on Thassos and even drew me a map. Lina and Yota did a great job with breakfast daily and rooms and bed was very comfortable. The hotel has been renovated and rooms are in great shape! I will definitely return to this hotel. The hotel is right on the beach. Service is good, but parking is a blow city away. The street in front of the hotel is busy and there is no place to drop off your luggage That said we plan on going back real soon! Theo, was very nice and stayed up late for check in as our travel in from Thessaloniki took longer than expected. We pre-booked a transfer service from airport costing around 140 euro. We failed to ask Theo for transport service but apparently he does for both Kavala airport and Thessaloniki for a much cheaper rate! Please save yourself some time and money and contact him before your arrival! Hotel was great, ocean view. Rooms are tiny, but welcome to Europe! Several cafés and super market nearby. Easy check in and check out process, thanks Theo! The location, right NexT to the beach...the view it was breathtaking...very Close to the Kavala city. Lina was a great host! Thank you for making our stay so pleasant! Great location! 1. The sea view rooms are gorgeous; 2. The private beach is nice and quiet ( there are no sellers or massage providers to disturb you ); 3. The lounges on the beach are free and you are not obliged to order from the bar; 4. The staff is really nice and willing to help you starting with the cleaning lady, the receptionist and finishing with all the peoples that work at the bar; 4. The village is small but you have tavernas close to the hotel and also a supermarket. You also can eat at the bar from the hotel; 5. The basic breakfast plate is the same every day but you have also milk, yogurt, cereals, croissants, etc that are at your disposal to choose extra. 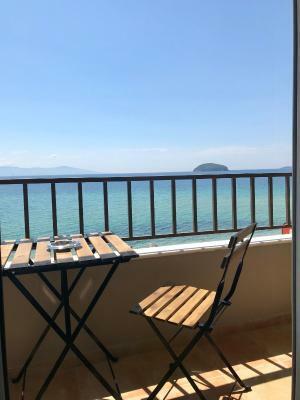 Spacious clean room, balcony is great with superb view of island of Tasos into the sea! the Staff was very friendly and helpful, the hotel have it's own parking which is very good. The beach in front of the hotel was great , the water is very clear and there are a lot of fishes for people that like snorkeling. 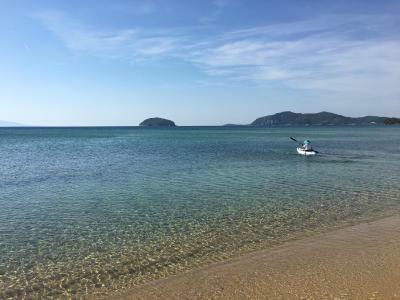 it is also sutable for children since you can walk 30-40 meter within the sea without the need to swim . We had a very nice relaxing stay. I like that the beach was very close and clean.The room was also very clean and big. I like the view from the balcony. 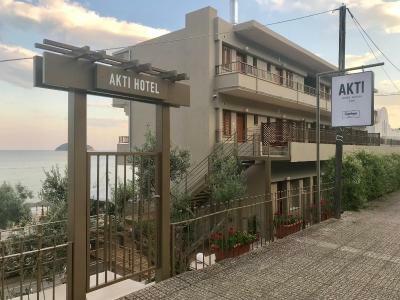 Hotel Akti This rating is a reflection of how the property compares to the industry standard when it comes to price, facilities and services available. It's based on a self-evaluation by the property. Use this rating to help choose your stay! 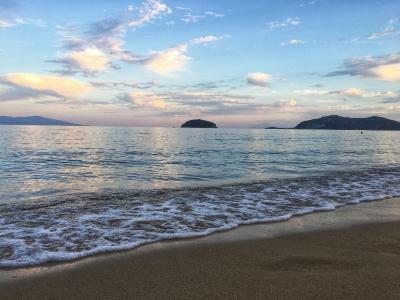 Hotel Akti is located directly on the sandy beach of Palio, at a distance of 3.1 mi from the city of Kavala. It provides deck chairs and umbrellas on the beach. The hotel offers 16 rooms equipped with air conditioning and satellite TV. Each comes with a sea-view balcony. Guests can also be accommodated on a bed-and-breakfast basis. The hotel's seasonal beach bar Il Primo offers cold drinks, refreshments and snacks. A bakery and a supermarket are available at a short distance from the hotel. Palio also offers a good variety of traditional restaurants. When would you like to stay at Hotel Akti? Enjoying sea view from its balcony, this air-conditioned room features a kitchenette, satellite TV and hairdryer. 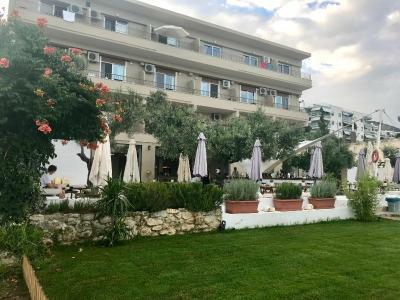 House Rules Hotel Akti takes special requests – add in the next step! Hotel Akti accepts these cards and reserves the right to temporarily hold an amount prior to arrival. Please inform Hotel Akti of your expected arrival time in advance. You can use the Special Requests box when booking, or contact the property directly using the contact details in your confirmation. Espresso for breakfast. Slightly better pillows. Only tea in room but no instant coffee. Some fresh fruit for breakfast. Everything was amazing, especially the staff, well those people was so kind, absolutely everyone very helpful, smiling, absolutely wonderful attitude! The beach is clean, and obviously in front of the hotel, you just walk 20-30 steps from the hotel and you are there! The traffic on the Main Street. Everything else was great! there was no TV in the room. there were mosquitoes in our room which was on the first floor no mosquito net or any protection into the room ( we saw that in the upper floors of the hotel rooms are equipped with mosquito net! so if you book first floor take with you some protection ) . The bar closes at 8 'o clock which is minus and there are no bar close by , but if you look for total relax it is ok. The breakfast was poor. The music from the bar...all day very loud, even between 2:00pm- 4:00pm...very difficult for sleeping ...actually impossible . I think that the price is too much for this place. Breakfast, every day the same. Now it have new owners and it seems that thay have not much experience. It's very clean. The beach bar waiter is excellent. The family running this place is absolutely fantastic. Real hosts, warm welcome, provided with a lot of useful information. The hotel is clean, is on the beach, all the rooms have sea view. The atmosphere is great!